A few months ago Bioten appeared in the greek market. I wasn’t convinced about this brand but I grapped a hand cream just to give it a try. 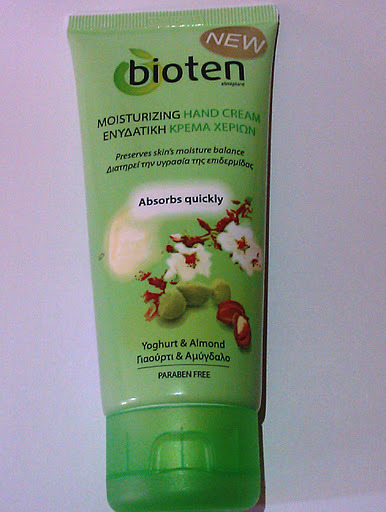 Today I am going to share with you my thoughts about Bioten Moisturizing Hand Cream with Yoghurt & Almond. It claims to offer an effective moisturization, leaving in the same time no greasiness as it is quickly absorbed. The cream is enriched with natural ingredients and it is paraben free. I chose this one because it contains yoghurt and almond, both known for their moisturizing actions. The texture is nice, not thick, nor dense. The cream leaves the skin hydrated and soft but not greasy at all. It absorbs quickly; that’s a huge *yeah* for those like me that don’t like to wait for their cream to absorb before they grab their cup of coffee! I even adore its smell; feels so refreshing. I can’t define what it smells, but I think is the sweet almond oil. My only concern is that it won’t moisturize enough dry hands. A few days ago my hands were very dry because of cold weather (and the tons of dishes I washed…hehe) and even if I used the cream I didn’t feel a huge difference. After two days of trying to get soft hands again, I tried Vaseline and the moisture levels came back to normal! Bioten didn’t pass this hard test. That’s why I can’t really recommend it for very dry skins. Unfortunately I don’t remember the price but it is cheap, maybe less than 3€ for 100ml of product. Not bad at all! In general, I think this is a good hand cream to have in your bag for emergency cases. Not so good if you have very dry skin though. Have you tried anything by Bioten? What do you think of this brand? όλο το καλοκαίρι χρησιμοποιούσα την κρέμα σώματος με lime και κυδώνι..η μυρωδιά της απίστευτη!! Never tried bioten before but the paraben and parafin free factor and the cheap price sound good. Unfortunately I have very dry hands especially now that the weather is cold!!! Thanks for the review! ❤ Αγαπώ αυτή την κρέμα! Θέλω πολύ να τη δοκιμάσω! Αυτό τον καιρό έχει και τέλειες προσφορές αυτή η εταιρία!